Following the sound of the explosion, flame rose far above the mouth of the shaft. Firedamp accumulated in one of the rooms and was accidentally ignited by a miner's lamp. When the work of exploration began, it was found that the whole force of the mine, 39 men and boys, were stark and cold in death. The State inspector's report stated that, at 2:45 p.m., the explosion tore out doors, stoppings, and brattices and knocked out timbers. All men in the mine were killed. A crew digging a drainage ditch tore down a door that had been nailed shut across a room mouth, allowing the air current to bypass the section of the mine inside that room. The gas accumulated in about 2 hours and was ignited by the open lights. The mine was known to be gassy and was wet. Ventilation and gas testing were lax. 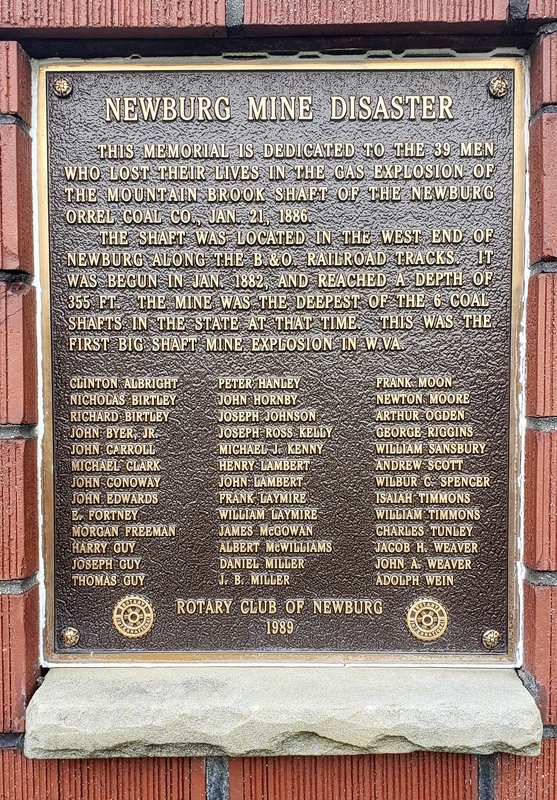 A terrible explosion occurred in the Orrel mine at Newburg, West Virginia last Thursday afternoon, resulting in the sudden death of thirty-nine men and boys. 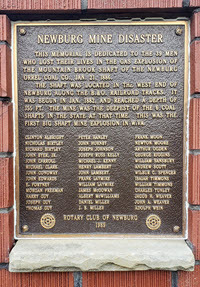 At about twenty minutes after 3 o�clock, while the day shift were working in the mine which is located in the outskirts of Newburg, the air was suddenly rent by a most tremendous explosion the force of which threw men down in the street half a mile away, shattered windows and doors all over town, and even crushed the sides of houses around the mouth of the mine, while from the deep shaft of the colliery, a dense cloud of mingled smoke and vapor arose high in the air. The shaft is 255 feet in depth and is divided into three compartments, two of which are fitted with cages and hoisting apparatus for bringing the coal to the surface while the third is the ventilating shaft. The main heading of the mine extends for 1,020 feet from the foot of the shaft in a southwesterly direction and parallel with it and from 75 to 100 feet east of it, is an air passage joining the main heading at the foot of the shaft and being also connected with it by cross drifts at intervals of about 100 feet. From this air passage the galleries or rooms extend for about 500 feet eastward, and in these rooms the unfortunate miners were working, being scattered pretty much all along the eastern side of the mine. Forty men composed the shift which went to work Thursday morning and of that number all but one are dead. The man who escaped is John Miller, who came up five minutes before the accident. The cause of the awful disaster is attributed to the removal by Albert McWilliams of a bulkhead across one of the ventilating galleries, which turned the fresh air from its proper course and permitted the accumulation of fire damp. When the explosion occurred the cages were at the bottom of the shaft and the tremendous force resulting from the combustion crushed them and the heavy timber lining of the shaft into a confused mass. The destruction of the cages obliged the rescuers to resort to the iron coal buckets as a means of reaching the level of the drifts and as they will hold but three men the work of removing the obstructions proceeded very slowly. Some of the men however forced their way through the mine and penetrated about 300 feet along the main heading. No bodies were found but several dead and horribly mutilated mules were discovered. As illustrating the force of the explosion within the mine, the rescuers report that one cross heading 80 feet long which had been filled up with solid mud and refuse, was blown entirely open, the enormous mass of debris being scattered for several hundred feet along the galleries. At the bottom of the shaft the scene of the wreck and confusion was horrible. Men, mules, shattered cars, and all sorts of debris were piled up in confusion. Men trod on a body before they knew how near they were to the dead. From the wreck below it is supposed that the explosion was violent enough to blow the men out of the most remote room through the experts differ as to whether the shock would necessarily be fatal. The idea is advanced that the most experienced miners knowing the nature of gas if not killed at once would have thrown themselves on their faces, there being the least foul air on the floor. This gives friends some grounds for hope but it is so slight that it is to be encouraged. It is believed by some who are familiar with mines that the rooms in the extreme portion of the workings are comparatively free from gas and that they may have afforded refuge to those in or near them. These gleams of hope are met by the afflicted families with moans of despair. They do not hope. Friday evening four bodies were found at the bottom of the shaft and there was no longer any hope that any of the men would be found alive. The calamity fell with terrible force on the little town. The cold weather froze out the miners and they could not work for ten days and little if any money is coming to the men who are on the death roll. Few of them had any savings and their taking off will leave their families in destitution. The town is able to do little for the sufferers. A liberal charity can find here a good field for its kind offices. Three mangled, torn, and blackened bodies have so far been removed from the shaft of the Orrel mine and restored to their sorrowing relatives. Saturday morning the first body was brought to the surface. It proved to be that of Isaiah Timmons, the fire boss, whose business it was to inspect the mine with a safety lamp before the men were put to work. He was found about 300 feet from the foot of the shaft, lying on his face, with his arms extended at full length. The body presented a horrible sight. The arms, limbs and ribs were broken in many places, and the flesh over the naked breast and arms was black as a charred log and deeply scored with burned and bloody furrows, while the features were deeply indented with coal dirt and were distorted out of all human resemblance. The coroner, ex-State Senator John P. Jones, had his jury view the remains. They were identified by David Evans, the man who found the body, and then an undertaker placed the remains in a rough box and removed them to his place of business, where they were prepared for burial. The cage was at once sent back down the shaft after the body had been brought to the surface, and in a few moments it returned with another body. Mr. Bens identified the remains as those of David Miller, cageman at the mine. His business was to attend to the running of the cars from the main entry back on to the cages, and his station was at the foot of the shaft. He was found lying partly on the base of the cage, with his head on the north side of the shaft. His appearance and injures corresponded with those of Fire Boss Timmons, except that his flesh seemed to be literally torn from his broken bones and to hang loosely upon them. Ten minutes later, Isaiah Timmons son, William, age 14, was brought out. He was the door trapper of the mine and his business was to mind the door opening from a space about the foot of the shaft into the main entry. He was lying on his face about six feet from the cage. His bones were broken in several places and his heavy cloth trousers almost entirely torn from his limbs. Judging from the appearance of these victims, a very little more violence would have torn them into fragments. It is understood that one more body, headless, had been found by the explorers but was not identified by them. There is a general fear that another explosion may occur. The men coming out of the shaft say the cross drifts from the main entry to the air passage on its east side are filled almost to the roof with all manner of debris, forced toward the shaft by the strength of the explosion, and behind these barricades fire damp must have accumulated in the rooms in enormous quantities. The bulkheads and doors regulating the currents of air are also entirely torn away and these must be restored before ventilation can be secured.